You need zinc for forming proteins and DNA and for proper immune function. Getting extra zinc in your diet isn't likely to cause weight gain if you are already getting the recommended amount, although some studies have shown beneficial effects on weight gain in people who are zinc deficient. Getting too much zinc can have adverse effects, however, so speak with your doctor before taking supplemental zinc to make sure it would be safe for you. The few studies that show a potential for zinc to improve weight gain involve people with medical problems and those suffering from malnutrition -- not healthy individuals. Weight loss and loss of appetite are associated with having a zinc deficiency, so it's understandable that improving zinc levels helps these individuals gain weight. Children with leukemia gained weight with zinc supplementation in a study published in the European Journal of Clinical Nutrition in 2013. Zinc supplementation may also be beneficial for weight gain in people suffering from anorexia, according to a classic study published in Acta Psychiatrica Scandinavica, and a classic study published in The American Journal of Clinical Nutrition noted that zinc supplementation helped with weight gain in children with malnutrition. However, that doesn't mean that simply taking a zinc supplement will help you gain pounds. Adult men need at least 11 milligrams of zinc per day, and adult women need at least 8 milligrams per day. A 3-ounce serving of beef chuck roast or Alaska king crab provides about 7 milligrams of zinc, and the same-sized hamburger patty provides about 5 milligrams. 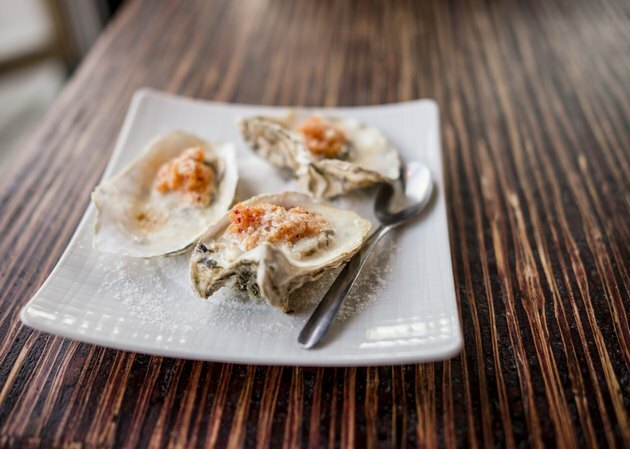 You'll get the greatest quantity of zinc if you eat oysters, however, as a 3-ounce serving has about 74 milligrams. Other foods that are good sources of zinc include cashews, yogurt, dark meat chicken, baked beans, lobster, fortified breakfast cereal and pork chops. Whole grains, nuts, legumes, dairy products and other types of meat and seafood also provide zinc. Because it's readily available from the diet, zinc deficiency isn't common in the United States, although vegetarians, people with gastrointestinal diseases, alcoholics, pregnant women and people with sickle cell disease may have an increased risk for this type of deficiency. Adults shouldn't consume more than 40 milligrams of zinc per day unless under a doctor's supervision, as this can lead to adverse health effects. High quantities of zinc can cause anemia because of impaired copper absorption, stomach pain, fever, coughing, fatigue, an increased risk of prostate cancer, loss of appetite, vomiting, headache, diarrhea and impaired immune function. The risks are greater with long-term consumption of excessive levels of zinc. Zinc may also interact with certain medications, including antibiotics, diuretics and the rheumatoid arthritis medication penicillamine. Avoid supplements and instead make dietary changes if you'd like to gain weight, recommends the Academy of Nutrition and Dietetics. Add calories with nutritious but high-calorie foods, rather than eating more of junk foods and sweets. These nutritious, high-calorie foods include nuts, avocado, cheese, dried fruits, olive oil and dry milk powder. Use milk instead of water to prepare soups and hot cereals. Smoothies can be a good snack to use when trying to gain weight, as you can include a number of nutritious but caloric ingredients, such as Greek yogurt, nut butter, flax or chia seeds, dry milk powder, cocoa powder, avocado and bananas. Include plenty of protein in your diet and participate in resistance training workouts to help you gain muscle rather than fat. Eating smaller, more frequent meals may also help you eat more calories each day.